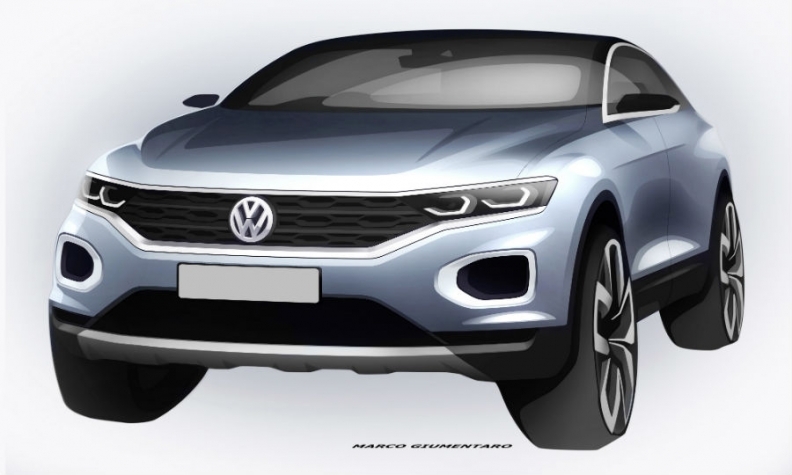 VW released a sketch of the T-Roc ahead of its unveiling this month. 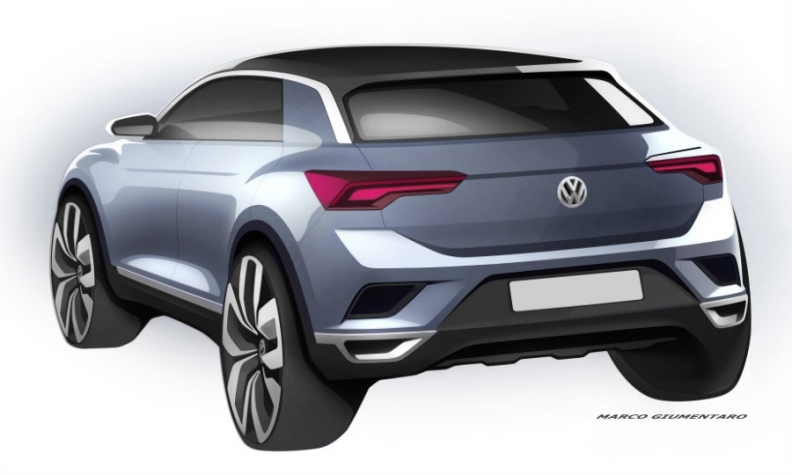 FRANKFURT -- Volkswagen brand's T-Roc SUV will fill a key gap in the marque's lineup when it arrives in Europe at the end of this year, giving the brand an edgier and more compact urban crossover alongside the traditional looks of the Tiguan. The T-Roc will be a core volume model as the brand expands its SUV range in the coming years. The other key model will be its smaller cousin, the T-Cross, which is expected to join the booming subcompact SUV/crossover segment sometime next year. Along with a 25 percent productivity gain in Germany and a return to profitability in the three loss-making regions by 2020, the VW brand's SUV offensive is an important pillar of its strategy to achieve a 4 percent operating margin by 2020. "It will be Volkswagen's first true lifestyle CUV – crossover utility vehicle – packed with highly innovative digital features and the latest driving assistance systems," said VW brand sales and marketing chief Juergen Stackmann during a conference call. "The T-Roc will be a very important model for the Volkswagen brand covering the SUV segment below the Tiguan." VW will unveil the T-Roc at a media event on Aug. 23 ahead of its public debut at the Frankfurt auto show next month. VW says the T-Roc will be its first true lifestyle CUV – crossover utility vehicle. Volkswagen brand CEO Herbert Diess said in May that the T-Roc would play a big role going forward as the brand launches seven new SUVs by the end of next year. "The T-Roc in particular will contribute to an increase in volumes and earnings," he told reporters. A VW spokesman said U.S. sales are currently not planned for the T-Roc but the brand will continue to monitor the development of small SUVs in the market. China will get a locally built, long-wheelbase version next year, the spokesman said. The T-Roc continues an SUV offensive that began in the first half. In China, the brand's largest market, accounting for roughly half of the brand sales, Volkswagen launched the long-wheelbase version of the Tiguan, where it is locally built, alongside the Teramont. The Teremont also debuted in the U.S., where it is known as the Atlas, and has had initial success with 5,329 vehicles already sold. "We are in a very early phase of the Atlas launch - it was launched in May of this year - and the initial reaction is just outstanding," Stackmann said. "We are almost sold out of stock of the car at our dealers already, with high demand and high specification levels," Stackmann said. "The customers are really shooting for very much loaded cars." Last month, VW replaced the short-wheelbase Tiguan in the U.S. with a Mexico-built new model that offers room for seven occupants with a third row of seats. The model will be sold in Europe as the Tiguan Allspace alongside the conventional Tiguan, which is built in Wolfsburg, Germany. On Friday, VW said it can begin orders for the Tiguan Allspace in Europe. Prices start at 29,975 euros in Germany for the base version with 148-hp, 1.4-liter gasoline engine. The Tiguan Allspace is 215mm longer at 4700mm than the standard Tiguan. Passengers have about more cabin room thanks to a longer wheelbase. VW said the top "Discover Pro" infotainment system also introduces gesture control to the segment.